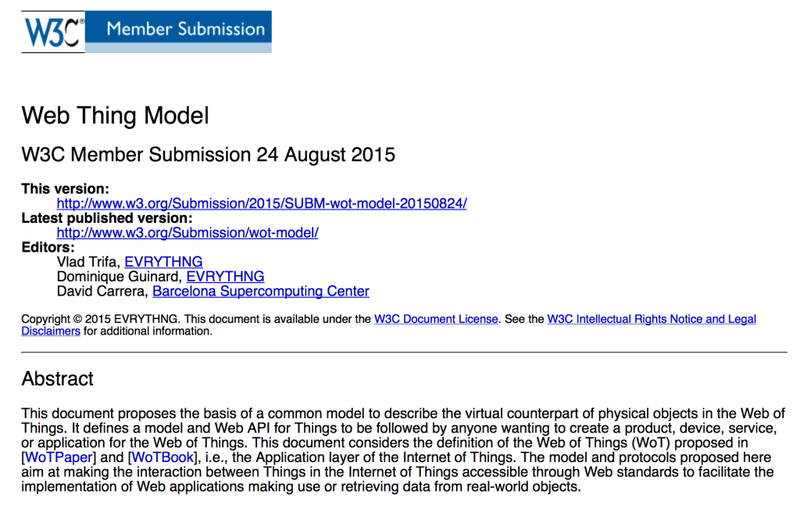 We’re proud to announce that we have made a Web Thing Model submission to the W3C, contributing to pre-standards work around IoT. This is a significant achievement for EVRYTHNG as a company, and for Dom and I personally as leaders of the Web of Things community and EVRYTHNG co-founders. Before I give you the highlights of what we’ve submitted, let me explain why this is so important. While the Internet of Things (IoT) is a hot topic, it’s far from reaching its potential. Consumers and companies alike largely focus on connecting discrete things – for the home, the vehicle, or gadgets, for example – rather than working towards a global-scale ecosystem with interoperability as a core element. Interestingly, connected devices are nothing new. We’ve been using IoT solutions for longer than the term even existed, from building security systems, to GPS-tracked logistics solutions, to location-aware applications on mobile phones. What we have as a result is literally hundreds of incompatible and competing protocols, controlling millions of devices. Rather than creating a world of devices that could talk to each other, we’ve created many isolated, small-scale networks: the Intranets of Things, if you will. Contributing to the W3C’s pre-standards work on WoT is one of the ways in which we’re trying to realise the true potential of the IoT. The content of our submission is based on the years of research that Dom and I carried out during our PhDs, then building the EVRYTHNG IoT Smart Products Platform – from a few drawings on a whiteboard four years ago to one of the leading IoT software platforms, connecting millions of physical products to the Web. Our Web of Things at EVRYTHNG has been further refined through our participation in the EU COMPOSE project (alongside IBM, WC3, the Barcelona Supercomputing Centre and other universities) developing an open technical framework for Internet of Things applications and services to connect with each other, and making it fast and easy to bring them to market. Indeed, HTTP/JSON are by far the most popular protocols used by most Web APIs today, and are supported by pretty much any programming framework on any platform. There’s a reason for that: Web standards are extremely versatile and powerful, yet at the same time open and very easy to use. We can’t say the same about the majority of IoT protocols or standards out there… To put it another way: there are (way!) many more developers out there that could send HTTP requests to RESTful APIs than computer whizzes able to write Bluetooth code or CoAP. The Web of Things is based on the idea that Web protocols are not only “good enough” for most IoT use cases, but are actually the most appropriate option for them. The Web has proved over the last decade that it is the most successful, large-scale integration platform out there, whatever your use case. By ensuring all devices and IoT applications can talk to each other with minimal effort, you’re enabling networks effects at a global scale. Instead of building new protocols from scratch, and also the entire set of tools and capabilities to deploying and maintain such applications for production, enterprise-grade applications. Web of Things applications can leverage – and integrate with, as-is – the majority of Web tools created and optimized in the last 25 years. We don’t need to re-invent the wheel and create new security protocols or caches from scratch, we just adapt and improve the ones used every day to power the existing Web. Sounds great! So how can businesses leverage this Web Thing Model? Simply put, this submission proposes a battle-tested and refined data model to unambiguously expose the metadata, commands, and data of any Web-connected product using a simple JSON document. Whether you’re implementing a REST API for your smart bike, golf club, or a Wi-Fi connected garage door – the Web Thing Model contains the best practices and guidelines to create a simple model for your product that other applications or devices can understand. Or better yet, if your product doesn’t have a RESTful API, simply connecting it to the EVRYTHNG IoT Smart Products Platform will give it one. EVRYTHNG has been architected to embrace these principles, so using by using our platform you can leverage the Web Things Model – and therefore make your product interoperable by design – within hours instead of weeks! Thanks to such a common model, companies can accelerate their go-to-market timeline and reduce their costs in deploying (and especially maintaining!) IoT products and solutions. In particular, the tools offered by our engine allows you to entirely separate the client applications and devices, so even if you change the firmware on your device and use a different protocol to make it talk to EVRYTHNG’s cloud, your client application won’t notice a thing, and will keep working without skipping a beat. Even further, you can build applications that automatically generate a custom and personalized user interface for all your devices, so you can launch a new product on the market without even updating your existing applications or existing integrations with back-office software. Finally, using a single common data model for all products means you’re future-proofing your IoT investment and can maximize the interoperability of your digitally connected products, therefore minimizing integration costs and efforts. This is a critical moment in the development of the Internet of Things. Independent institutions like W3C are essential to balance individual commercial agendas and ensure that the IoT moves from a complicated maze of disjointed standards to an open, universal Web-based system. We love what the power of the World Wide Web has helped our societies and economies achieve so far, and believe it makes all the sense in the world to take the same approach with the IoT. Want to learn more? We’ve shared more on this topic on O’Reilly Radar, and in a press release.